Image caption Dr Rajeshkumar Mehta was jailed for 15 months at Birmingham Crown Court in April last year. 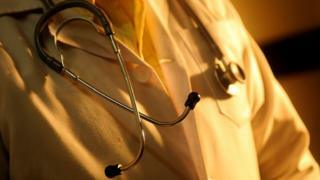 A doctor who sexually assaulted a female patient has been struck off the medical register. Dr Rajeshkumar Mehta, 64, had been jailed for the offence, committed while employed as a locum at The Hill General Practice and Care Centre in Sparkhill. The Medical Practitioner Tribunal Service said the conviction "undermines the trust and confidence the public puts in the medical profession". Mehta has 28 days to appeal against the decision. He was not present during the hearing, which concluded on Friday. Mehta, of Dale Meadow Close in Balsall Common, Solihull, was found guilty of one count of sexual assault and jailed for 15 months in April 2018. The report from the MPTS hearing said the tribunal heard the sentencing remarks of the trial judge, which said the woman had been "complaining of what might have been the early symptoms of a heart attack" when Dr Mehta touched her inappropriately and made comments of a sexual nature. Taking into account the evidence against him, the tribunal said it found his conviction "to be extremely serious". The report said his fitness to practice was impaired by reason of his conviction.